Left: A 9' x 12' Bleached White Kidassia Goat Rug. Middle: 4' by 6' on the right. Right: Back of a Kidassia Goat Rug. The natural white skins are "creamy white" with a yellowish hue. The bleached white are not snow white, but are much whiter than the natural skins. With a wool length of approximately 4.8”, the Kidassia goatskins make ideal rugs and furniture coverings. Click HERE for a picture of the backside of a 9' by 12' bleached white kidassia rug. Genus and species: Capra hircus Ranch raised. 1) We only stock bleached white rugs at this time. Other colors besides bleached white may be available on a custom-order basis. 2) Other sizes are available on a custom-order basis. Please note that rugs larger than eight skins become very difficult to handle and have significant price increases for labor. Depending upon the size of the rug, it takes two to three people to sew the skins together. Very large area rugs can be made by using two-inch wide Velcro tape to keep the rugs together. 3) We do not accept credit card payment on orders of Four-Skin Rugs and larger in colors other than bleached white. Custom orders must be paid for by wire transfer or bank draft prior to shipping. If you want to pay by wire transfer, please call us for our banking information. 4) Authorized returns only within five days of receipt if you are unhappy with the rug for any reason. You pay shipping and insurance both ways. No returns on used rugs or custom sizes or colors for any reason. 5) Please allow four to six weeks for completion of custom work. Rugs that are in stock are usually shipped within one to two days. 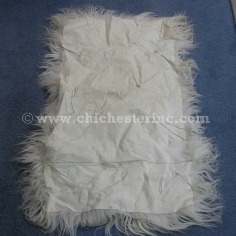 6) We can add a lining to the back of the skin for an extra US$250. We can use velvet or wool for the backing. We do not recommend a satin backing as the rug will slide too easily. 7) These are natural products and the rugs may shed some hair over time. We will not take any rugs back for shedding or loose hair. The solution is to comb or beat the rugs and vacuum in the area around them. We do not recommend using a floor vacuum with wheels on the rug itself as the fibers may get caught in the wheel and be ripped out. 8) Because there are about two hundred possible different colors and an infinite number of sizes, we do not accept returns for any reason for custom orders. If you want to see the workmanship prior to ordering a custom color or size, you can purchase 4' by 6' rug to look at and send it right back for a refund. You are responsible for shipping costs both ways. To remove any dirt, brush along the nap (in the direction of the hair, not backwards) using a bristle comb or horse brush. To clean spills or extra dirty areas, use a very small amount of shampoo on a damp sponge. Sponge along the nap repeatedly. Rinse the sponge to remove the shampoo and dirt and repeat until the hide is cleaned. Dry using a towel running along the nap. Do not throw in the washer. Click HERE for more information on the Kidassia Goatskins used to make these beautiful rugs. Click HERE for our main Goatskin page.